Here's a few pics of the villainous "bow bug" that's been killing my violin bows! This has been going on now for about 3 months... don't know where he came from but he has been impossible to find until now. I had one of my cheap bows start shedding hair and I knew immediately what the issue was. BOW BUGS! Arrgggghhhhh. well I left two old junk bows out on the couch, set all my cases there unzipped and waited... sure enough. Today I find a few "chewed" remains of bow hair and several broken hair strands. I looked carefully and found the little bugger feasting on a hair... and captured him. I took him out to the microscope so you can see the cute little furry thing. If they weren't so hungry for bow hair and were quite a bit bigger, like a rat or cat, they might make cute little furry pets... this one of course is meeting a different demise. Enjoy the pictures, oh and they crawl but not very fast so you can easily catch them if you find them. There's one pic that shows it next to some violin bow hairs for size comparison. Eww! I've heard about bow bugs but didn't understand where they come from so I googled it. Apparently, they're also called carpet beetles and they eat a variety of materials. It makes more sense to me that the bugs are not exclusive to violin bows, as you wouldn't think there would be enough bows in the world for the species to survive. Well - that put me off my breakfast ! Looks like they come crunchy right out of the box and they are obviously high in fiber. About 30 or 35 years ago I decided to drag out the old fiddle and mess with it as I periodically did over a 55 year lull. I was shocked to see bow hair all over the inside of the case, (I had had the bow re-haired approx. 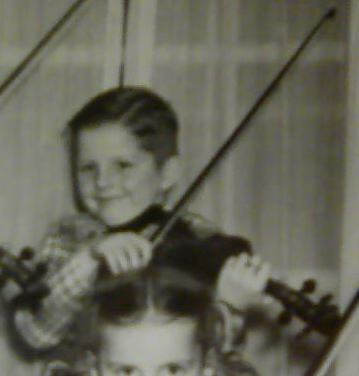 two years prior) then I bought a "Glasser" student bow for $25.00 rather than having the bow re-haired again. Then I found out about leaving the bow enclosed in darkness and started leaving my 6 bows out in the light, (the carpet mites hate light). I now (for the past two years) leave them laying all in a row directly on the carpeted floor and have had no problems with the pesky little bugs. is the bow bug dead yet Denn? After several days of non-participation by any new bugs, I thought I had eliminated all traces and was home free... wrong. I then proceeded to take all the violins off the couch, remove all the cushions carefully and inspect them with a bright light... On the second cushion, in between a fold of material I spied the shape and color of a unwelcome guest... I grabbed a piece of copy paper from the desk and proceeded to scoup it out, tapping on the cushion until it finally dropped out....sure enough... a bow bug! Now I have 2 of them in my sealed container...kinda like a trophy case for the villians of the violin. So, after catching that one, I proceeded to inspect every inch of the remaining cushions (3 total) and couldn't find any more, but took the vacuum and did every inch of that couch I could get my hose to reach. Hopefully they are all gone now. It's been a week and so far, no more broken hairs. You planning to preserve them in embalming fluid, Denny ? omg 😮 but at the same time, thanks for the post! learned something new today, and it's not even 10 o'clock yet! wow- I thought I saw an unusual bug this morning, and took a second look to see if it was one of these creatures- turns out I found an entire nest of ants- that were hatching- but for sure this post was motivation for me, and informative- thanks. I would post a picture, but most are in the throws of death at this point. THANKS ! That bug really is kinda cute... if it only didn't munch on natural fibers, lol. Since as an avid knitter, I have a stash of yarn that is all wool, silk or alpaca, I'm always on the lookout for things wanting to nibble on stuff like that. Cute as it is, it can go live somewhere else, lol. I am an avid knitter also... and I am not fond of the things that munch my wool. A favorite pink shawlette has fallen prey since last year. I have to do a cleaning and figure out how and what got in my closet. Eeek! @coolpinkone I have been lucky so far, but I've only been knitting about 4 years, so my stash is all fairly new. I think my time will come, and I dread it. The bugs better stay away from my sweaters! CoolpinKone and Damfino, I wonder if you put some cedar or lavender sachet in with the yarn and finished projects if it would deter the bug, supposedly works with moths. oh yes.. my yarn is in ziplock bags. For sure. What sometimes comes under attack is my finished garmets. I have never had an issue with anything hanging. (I have been knitting a LONG time) I have a closet full of shawls, scarves, socks and sweaters. 🙂 I had an issue about 10 years ago.. and nothing since. So I will be tearing apart my closet and inspecting and putting some cedar blocks. The little bugs that eat the wool... look more like larvae, not so much like Denny's bow bugs. Again.. I haven't seen one in 9 years... I am unsure if this particular scarf had fallen or been left somewhere.. but you bet I will be inspecting soon.